Timor Python is a medium-sized python of medium girth. 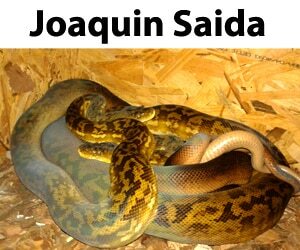 They have an attractive brown pattern which is only visible on the anterior of the snake. The rear part of the Timor Python does not have any pattern and most of it is green and brown in color. The head is wider than the neck, the tail is relatively long, but not particularly prehensile. Occasional specimens, particularly females, can become relatively heavy-bodied. Like many python species, Timor pythons have a series of heat-sensing pits between their nostrils and mouth. Juveniles can be housed in small terrariums 0.25 meters wide x 0.3 meters long x 0.2 meters height (0.8 x 1 x 0.65 feet) with some hangers which are rarely being used. I keep my adults in two; 0.75 meters width x 0.9 meters length X 1.5 meters height (2.5 x 3 x 5 feet) terrarium. The terrarium is separated in the middle , communicating with a window which I use to keep them together or apart depending on the season. Both of the adult enclosures are decorated with branches . For the babies I use small black boxes of 0.15 x 0.15 x 0.06 meters (0.5 x 0.5 x 0.2 feet). and a lateral opening. In each adult terrarium I have placed two wooden boxes with the measures of 0.5 x 0.4 x 0.3 meters (1.6 x 1.3 x 1 feet) . The one is hanging on a terrarium walls and the other is placed on the floor. Your choice on substrate should be something readily available and one which lends itself to easy spot cleaning and other cage maintenance chores. For babies I use absorbent paper substrate. For adults I prefer coco and peat as a substrate. Timor pythons seem to thrive best when kept in summer (April-September) daytime at 31 ºC (88 ºF) and 29 ºC (84 ºF) at nighttime. In winter 21-22 ºC (71-72 ºF) daytime and 18 ºC (64 ºF) nighttime. As far as lighting goes, in winter I provide them 8 hours of light and in summer 12 hours of light. Provide fresh water at all times. It’s preferable to use a container of water which your Timor python can use for bathing. I spray twice a day during winter (October to April) every other day. In summer I spray twice or three times per week. The babies – Their feeding schedule is a thawed baby rat every 7 days alternating with medium defrosted mouse. Everyone snake ate the first time and they rarely refuse food. Adults – I feed my male every 15 days with a rat adult (250-300 grams) in the summer. I feed my female every 20 days with 2 adult rats (250-300 grams) during the summer. After copulating step at a rate of 200 grams every 15 days. I continue with the same feeding schedule in the winter but with smaller rats (150-200 grams) every 30 days. I have had cases where my snakes were fasting so keep this in mind if you encounter something similar. 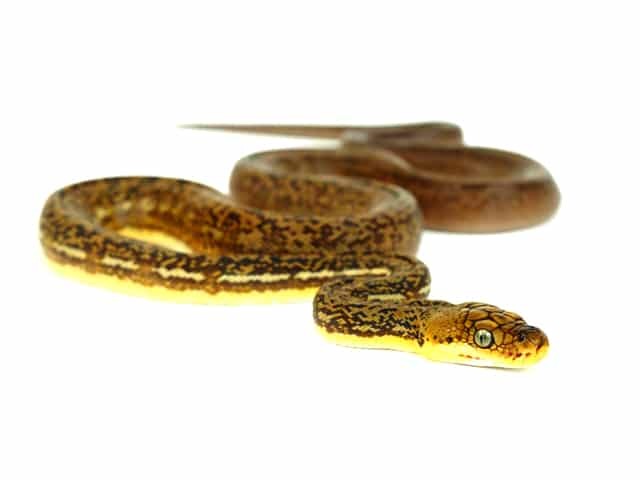 Timor pythons are generally well natured, easy to handle snakes that are very agile and quick. As with all animals their temperament is variable between individuals but generally good if they are not made to feel stressed or threatened. They don’t try to bite. Their most common defensive mechanism is defecating on the handler. As with all reptiles, keeping their cage clean is very important to maintain healthy animals and prevent many ailments. With my snakes I spot clean on a weekly basis at a minimum or as soon as I notice a defecation. I replace the substrate as needed when spot cleaning. Every three months I completely remove all substrate and deep clean the cage. I also spray the terrarium with a solution of water with ivomec (ivermectrina) at a rate of 1000/0.001 once a month to prevent the possible occurrence of mites. Babies shed for the first time 12 days after their birth, and then every 20 days more or less. Adults shed every two months, is relative, since it depends on the power supply.